WASHINGTON, DC, June 16, 2017 (ENS) – A federal judge has ruled that the environmental review of the controversial Dakota Access pipeline, DAPL, is insufficient and must be reconsidered. The ruling is being hailed as a major victory for the Standing Rock Sioux Tribe and its allies, and a vindication of the concerns the pipeline has raised from the beginning. Judge James Boasberg of the U.S. District Court for the District of Columbia, ruled Thursday that there were legal flaws in the U.S. Army Corps of Engineers’ permitting process for the Dakota Access pipeline. The Dakota Access Pipeline is a 1,172-mile underground 30” pipeline being built by Energy Transfer Partners, extending from the Bakken/Three Forks production area in North Dakota to Patoka, Illinois. 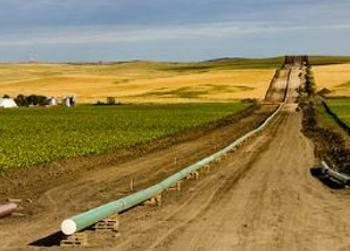 The Dakota Access Pipeline began commercial service June 1, says Energy Transfer Partners. The Dakota Access Pipeline protest, known by the hashtag #NoDAPL, is a grassroots movement that began in early 2016 in reaction to pipeline construction approval. After skirmishes throughout 2016 and anti-pipeline demonstrations across the country, in October, armed soldiers and police cleared an encampment of thousands in the proposed pipeline’s path. In November, many new participants joined the protest. Police used water cannons on protesters in freezing weather. 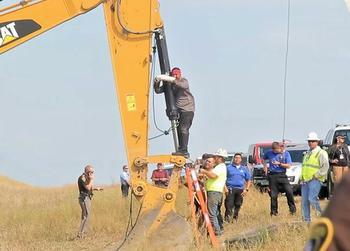 On December 4, under President Barack Obama’s administration, the Corps denied an easement for construction of the pipeline under the Missouri River half a mile from tribal land. 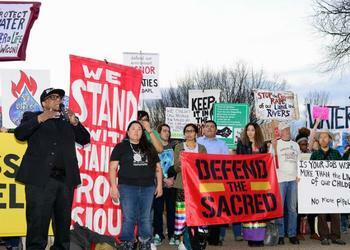 The Standing Rock Sioux objected to the route so close to their land because a spill could contaminate their drinking water, particularly after the pipeline’s route had been moved near their land to avoid contaminating drinking water at the state capital, Bismark. On January 24, 2017, President Donald Trump signed an executive order to advance the construction of the pipeline under “terms and conditions to be negotiated,” expediting the environmental review that Trump described as an “incredibly cumbersome, long, horrible permitting process.” On February 7, 2017, Trump authorized the Army Corps of Engineers to proceed with permitting, ending its environmental impact assessment. Judge Boasberg’s decision comes two weeks after revelations published by investigative reporters from “The Intercept” that revealed wartime tactics employed by TigerSwan, a pipeline security firm that painted the #NoDAPL movement as a dangerous insurgency and branded the tribal activists who call themselves “water protectors” as criminals and terrorists. More than 100 internal documents leaked to “The Intercept” by a TigerSwan contractor, as well as over 1,000 documents obtained through public records requests, reveal that “TigerSwan spearheaded a multifaceted private security operation characterized by sweeping and invasive surveillance of protesters,” The Intercept states. Leaked internal TigerSwan communications describe the #NoDAPL movement as “an ideologically driven insurgency with a strong religious component” and compare the anti-pipeline water protectors to jihadist fighters. But the Lakota attorney denies this characterization of the #NoDAPL water protectors and maintains that they are motivated by the urgent need for environmental protection. Jan Hasselman, the Earthjustice attorney who represents the Standing Rock Sioux Tribe in their lawsuit against the Army Corps of Engineers, says the ruling is not the last word on the pipeline’s legality or operations. “We continue to face significant headwinds under this administration,” Hasselman said. On June 21, the same court will hold a status hearing on this case to determine how it will proceed, including next steps to the judge’s decision on whether the pipeline will be switched off while the Corps complies with the court’s ruling. Yet NEPA does not require the government to make the most environmentally-protective decision. It prohibits uninformed decision-making but does not prohibit actions that carry risk. Judge Boasberg found that the Trump administration decision fell short in three important respects, all of them fundamental to the tribe’s concerns. First, the judge held that the Corps failed to address, or even mention, significant expert criticism of the agency’s oil spill risk review, which found that the Corps’ risk analysis was inadequate in several respects. Second, the judge found that the Corps never adequately considered the impacts of an oil spill on the tribe’s treaty rights, which includes protecting the tribe’s right to hunt and fish on tribal lands. Third, the judge found that the Corps’ environmental justice analysis was unlawful because it adopted a half mile buffer to assess oil spill risks, when studies have shown that, on a river like the Missouri, oil spills could reach far beyond a half mile. “Only considering environmental justice implications within half a mile, when the Standing Rock reservation lies 0.55 of a mile from the pipeline, was not reasonable in the Court’s view,” Hasselman explained. But the court upheld other parts of the Corps’ analysis, finding, for instance, that the Corps did not violate the tribe’s treaties with its decision. There are two big questions ahead, says Hasselman. First, the court has returned the permits to the Corps for further review, but did not direct the Corps to perform an EIS, which means that the agency could just revise or update its environmental review and again conclude that no EIS is required. If that happens, Hasselman says, additional legal challenges are likely. The tribe believes this court decision should trigger a full EIS, including consideration of route alternatives, just as the Obama administration proposed in December. The tribe is inviting its supporters to share their views with the Corps and the White House, stating that this is the proper path forward. Second, the court has left open the question of the pipeline’s fate while this review process goes forward. Hasselman explains that normally, when a permit is issued in violation of the National Environmental Policy Act, the appropriate remedy is to “vacate” that permit, to make it invalid under law. That would have the effect of forcing the pipeline company to shut down the pipeline while the review is conducted. But the court acknowledged that sometimes permits can be left in place during this period. In that case, the pipeline could continue to operate while the review is underway. The tribe’s position is clear. Until there has been a thorough analysis of the risks and consequences of operating this pipeline, an analysis that meets the standards imposed by the law, the pipeline should not operate. Hasselman says he will make that case “forcefully” to the court, and he expects a decision in the next month or two.